In Canada, the canoes from the Chestnut Canoe Company set the standard by which all others are measured. Now, forty years after the company went out of business, they are still held up as classic canoe icons. So, how can you identify a canoe as a Chestnut and what makes a Prospector a Prospector? The Chestnut Canoe Company – William and Henry Chestnut started building wood-canvas canoes in 1897. 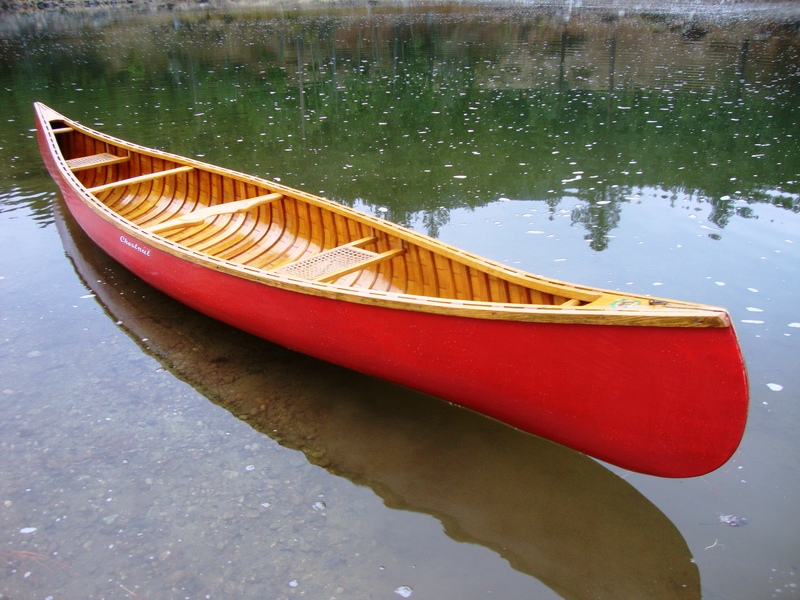 They bought a canoe in Maine (probably a Gerrish canoe) and made exact copies of it which they then sold out of their father’s furniture business in Fredericton, New Brunswick. They incorporated the canoe business in 1905 which most historians view as the birth date of the company. However, the 1972 Chestnut Canoe Company catalogue proudly celebrated 75 years in business. It seems the company viewed its birth as 1897. Be that as it may, the company grew into the largest canoe manufacturer in Canada and, at their height, were producing in excess of 3,000 canoes/year. In 1923, Chestnut Canoe Company and Peterborough Canoe Company (and later Canadian Canoe Company) amalgomated under an umbrella group called Canadian Watercraft Limited. As a result, the wood-canvas canoes for all three companies were built in Fredericton by Chestnut. The Peterborough Canoe Company ceased operations in 1961 while the Chestnut Canoe Company continued until it closed in 1978. Chestnut produced over 50 different canoes in a wide variety of models. In this article, I will focus on the most common Chestnut canoes — Ogilvy, Cruiser, Bobs Special, Pal and Prospector. The Chestnut Ogilvy – Although never as popular as the others, fishing guides on the salmon rivers of New Brunswick helped create a working canoe that is unmatched for its purpose. They needed a river canoe they could stand up in all day long. They were often poling the canoe upstream through shallow rapids in order to offer the prime fishing spots to their clients. The canoe had to be stable and tough with a shallow draft so as to avoid many (but not all) of the rocks. They come in six models that range in length from 16’ to 26’ – real, honest working canoes. The 16’ model has a 36” beam and 13½” depth at the centre. The ribs are 3” wide, 3/8” thick and have only ½” space between them. This creates what amounts to a double-planked hull. The rugged nature of the Ogilvy comes with a price in terms of weight. The 16’ has an average weight of 84 pounds and a carrying capacity of 850 pounds. It has a flat-bottomed hull, straight sides, full entry lines and modest rocker in the ends. This makes for a canoe that is slow and steady – exactly what is needed when moving through shallow, rapid rivers. 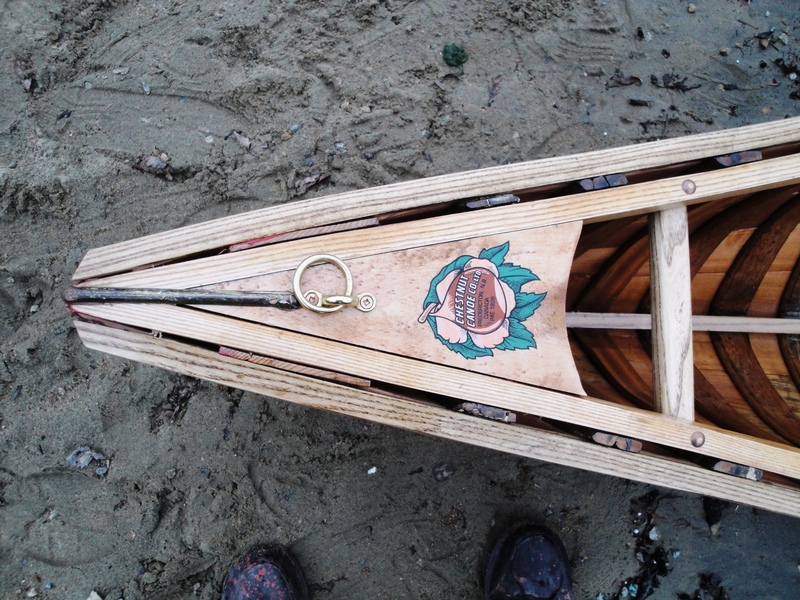 The Chestnut Cruiser – This canoe was one of the first canoes that Chestnut developed. It was influenced very heavily by (if not copied directly from) Gerrish canoes built in Maine in the late 1890’s. The lines are sleek, narrow and graceful – designed to handle rivers with speed and efficiency. 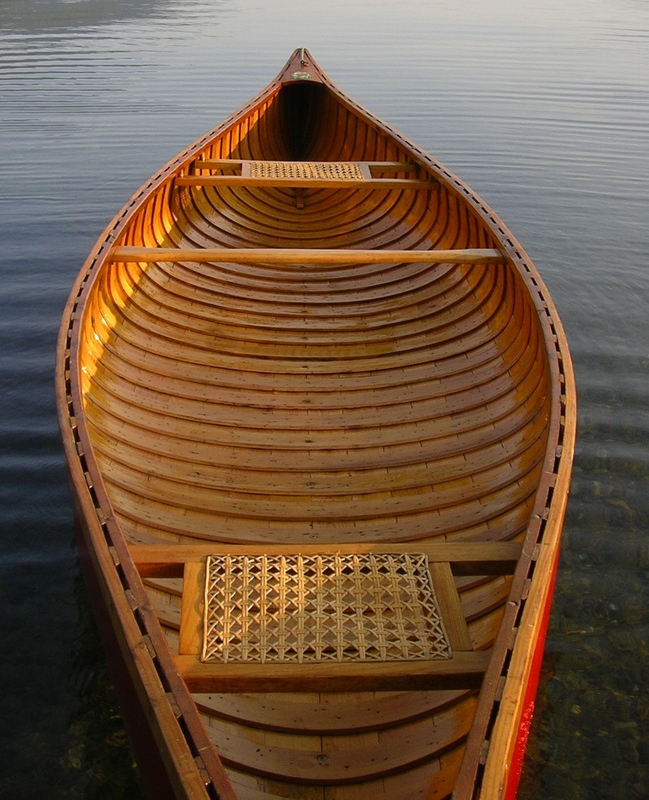 This narrow canoe has an arched bottom, fine-entry lines and generous rocker at the ends. Therefore, it was not for the novice paddler. 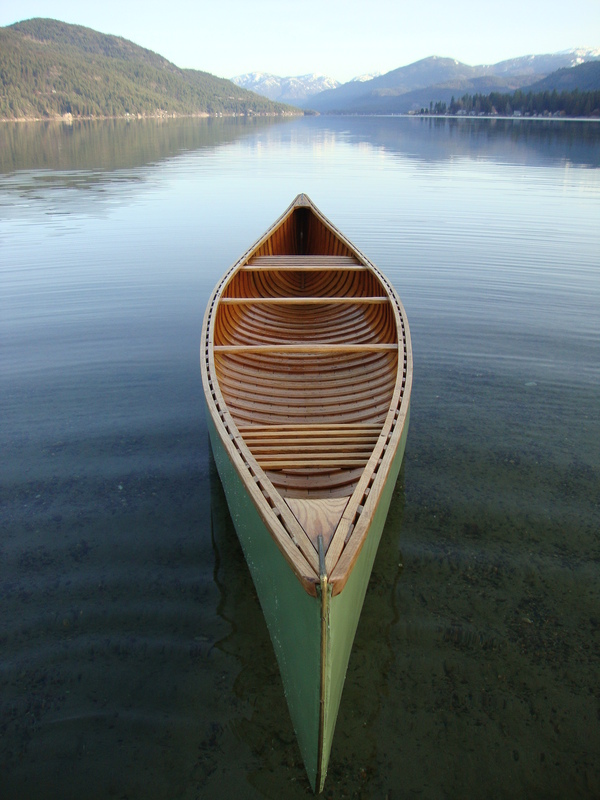 However, in the hands of someone who knows what to do, this canoe is a dream to paddle. Three models are 16’ 17’ and 18’ long. The ribs are 2-3/8” wide, 3/8” thick with 2” spaces between the ribs. The 16’ model has a 34” beam, is 13” deep and weighs 70 pounds. They are also built with ribs 3” wide, 3/8” thick and ½” spaces between the ribs. These heavy-duty models are called the Guide Special. The 16’ model weighs 75 pounds. Both 16’ models have a carrying capacity of 600 pounds. 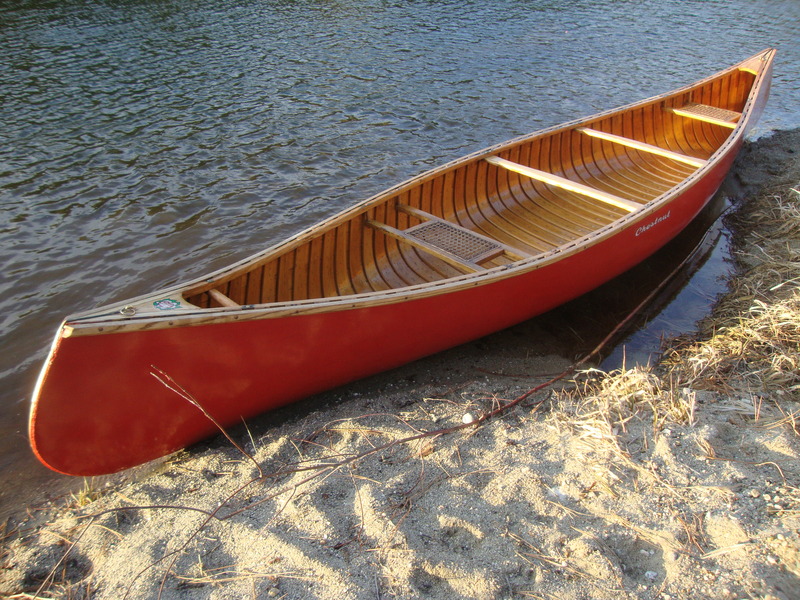 The Chestnut Bobs Special – This 15′ canoe is one of two lightweight pleasure canoes built by Chestnut. Before I talk about the canoe, I’d like to clarify the name. According to Roger MacGregor in his book “When the Chestnut was in Flower”, Henry and Will Chestnut were real history buffs. The telegraph code for the 15’ 50-Lb. Special was BOBS and made reference to Lord Roberts, a major figure during the Boer War in South Africa. 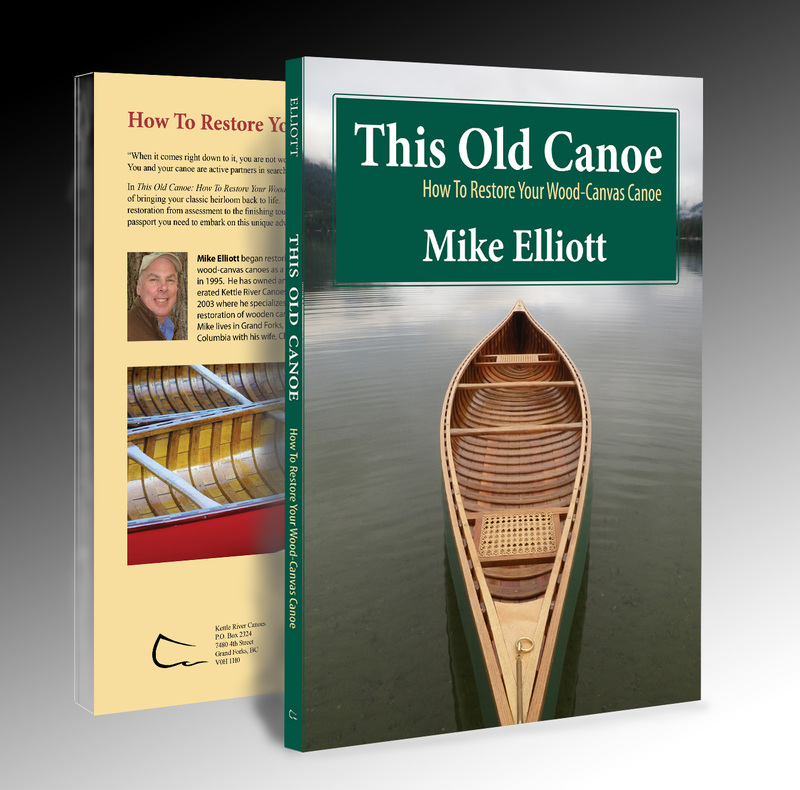 Over the years, as this wide, light-weight canoe became more difficult to keep under the weight limit of 50 lbs (the average weight is 58 pounds while the carrying capacity is 700 pounds), they changed the name. I have seen a variety of Chestnut catalogues call it “Bob’s Special”, “Bob Special” and “Bobs Special”. So, feel free to take your pick. Many outdoor enthusiasts were looking for a lightweight, stable canoe that would allow them to enjoy fly fishing or just a quiet paddle on the lake. 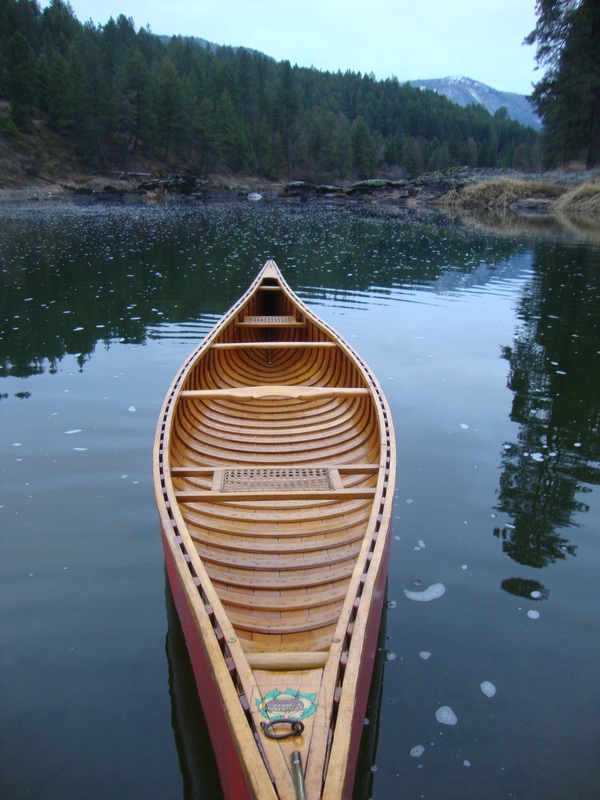 With a 37” beam and 12½” depth at the centre, the Bobs Special is very stable — ideal for those who find a regular canoe too ‘tippy’. At the same time, it is surprisingly quick and maneuverable in the water. This is due to the shallow-arch bottom combined with moderate rocker and fine entry lines in the ends. The ribs are 2-3/8” wide and ¼” thick with 1½” spaces between them. 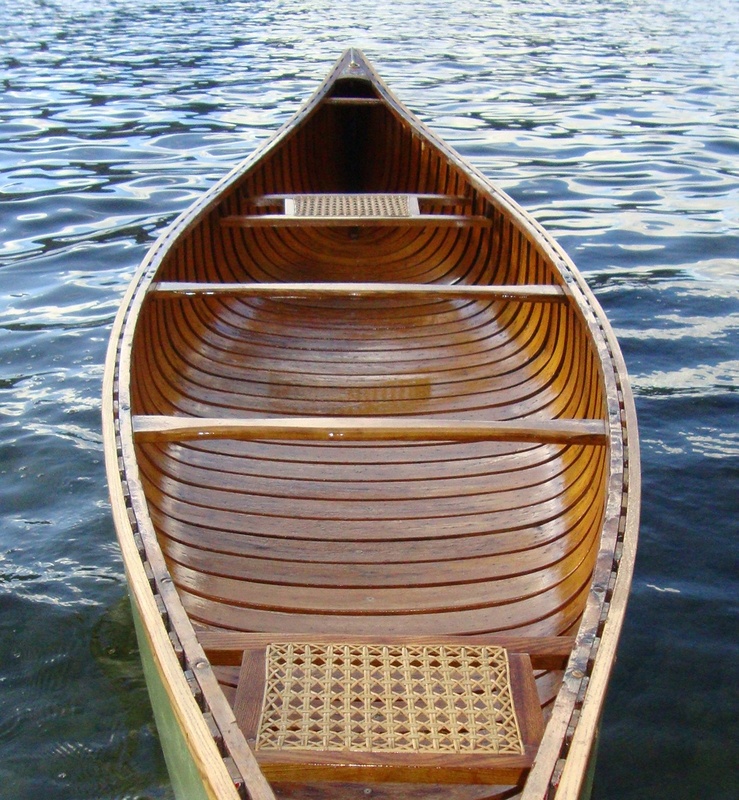 The Chestnut Pleasure Canoes – It is no accident that Bill Mason used a 16′ Chestnut pleasure canoe in most of his films. It is stable, yet quick; steady, yet agile. It has a 36” beam, 12¾” depth at the centre, weight of 72 pounds and a carrying capacity of 700 pounds. It is as close to being a perfect recreational canoe as you ever hope to get. It had a variety of names over the years and was one of the Chestnut pleasure canoes which also came in 14’ and 15’ lengths. Until 1958, the 16’ pleasure canoe (called the Ajax or Moonlight) had a 34” beam. Then, the mould was widened. The economy version of the 16’ pleasure canoe had been called the Pal for several years (from about 1954). 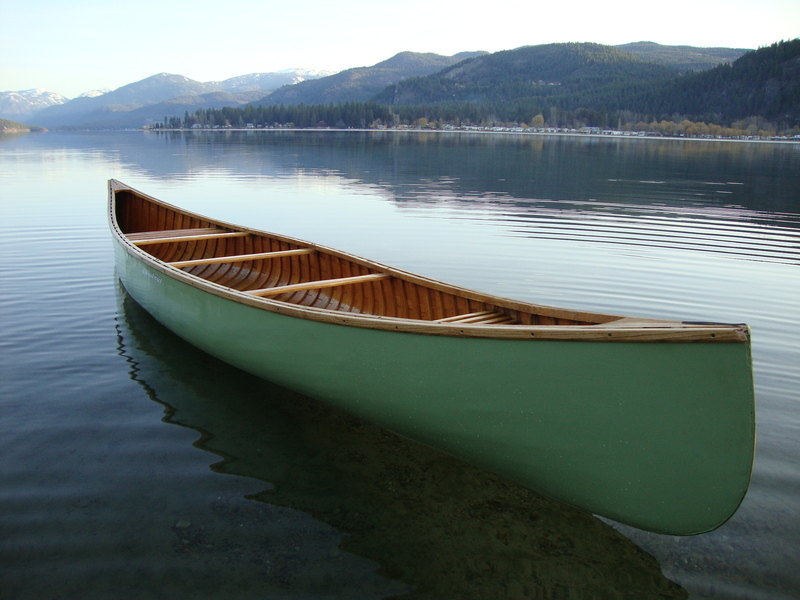 The pleasure canoes came in both narrow and wide versions until about 1960 when the wider versions were adopted exclusively. 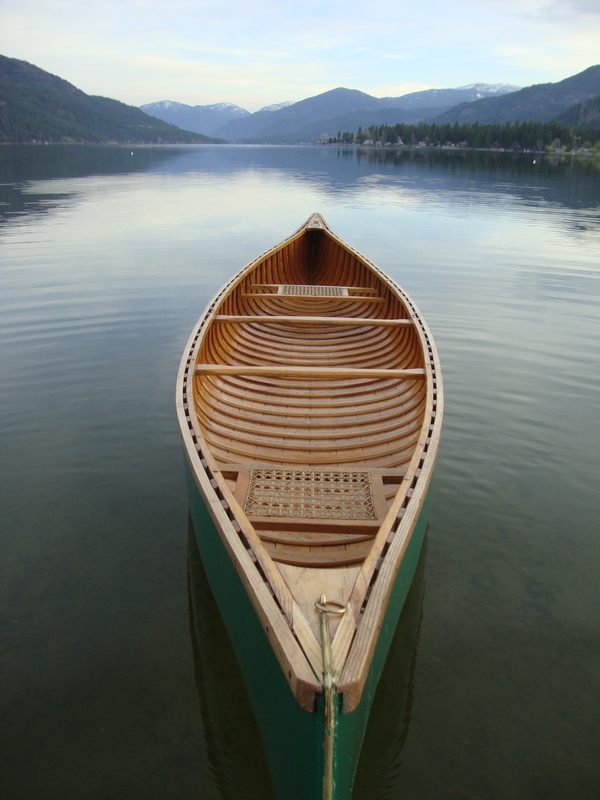 Over the years, the ribs of the pleasure canoes came in two different sizes – either 1½” wide and 3/8” thick with 1½” spaces between ribs or 2-3/8” wide and 3/8” thick with 2” spaces. The 16′ was called the Pal or the Deer, the 15′ was called the Chum or the Doe and the 14′ was called the Playmate or the Fox. The bottom has a shallow-arch hull with tumblehome extending through the entire length of the canoe. The fine entry lines and moderate rocker make it very easy to paddle. In his film, “Path of the Paddle: Solo Whitewater”, Bill Mason demonstrated very well that the Pal (or Deer) was not designed for Class 3 rapids. But, that didn’t stop him from trying. The Pal (or Deer) is a great general-purpose canoe and was the canoe of choice for many generations of canoeists – even if many of them called it a Chestnut Prospector. The Chestnut Prospector – This is the real deal – often copied, never matched. 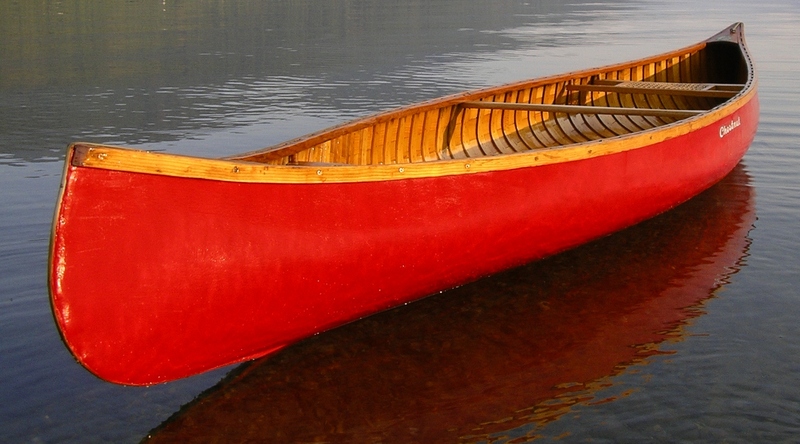 A quick search on the internet produces at least ten modern canoe companies with a “Prospector” in its catalogue. However, the Chestnut Canoe Company invented this winning combination. With high sides, substantial arch in the bottom and lots of rocker in the full ends, it is designed to transport heavy loads quickly through rapid rivers and large, challenging lakes. It is essentially a deeper, wider Cruiser and is still regarded as the ultimate wilderness tripping canoe. Like the Cruiser, many people unfamiliar with these canoes find it a little “tippy”. The round bottom of the Prospector makes for a “shaky” feel when you first get in. However, it becomes much more stable as weigh is loaded into the canoe — making it perfect for extended trips. It also settles into a stable position when heeled over to one side. 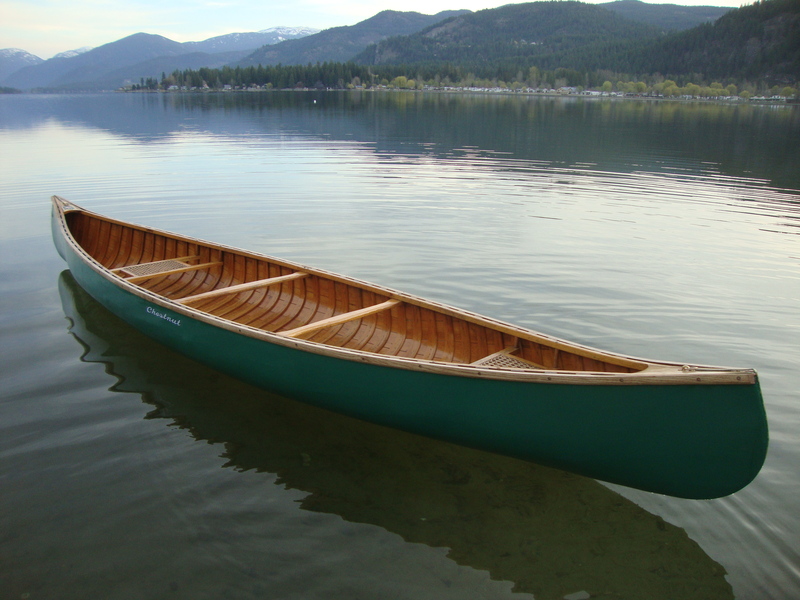 As a result, many people love it as a solo canoe. They were made in five lengths from 14’ to 18’. The 16’ model has a 36” beam and a 14½” depth at the centre. The 16’ model weighs 76 pounds and carries 850 pounds. Although there is good tumblehome at the centre, the hull flares about 4’ from the ends in order to throw water away from the canoe while hitting big waves in rapid rivers. The ribs are 2-3/8” wide, 3/8” thick with 2” spaces between them.